﻿ Hardin County Historical Museums, Inc - Ohio. Find It Here. 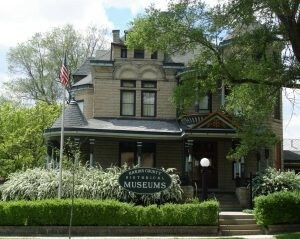 Located on N Main Street of Kenton, OH, the Hardin County Historical Museums, Inc is a must see place. The home in which the museum is housed was built in 1896 by Daniel Sullivan who was a harness maker. The house was the first in Kenton, OH to have electricity and electric lights. All of the original woodwork remains in the house as was as the imported chandeliers from France. Exhibits in the museum include the world famous Kenton Cast Iron Toys including a large collection of Gene Autry cap pistols with their original boxed. Kenton is the home of Jacob Parrott, who was the first Medal of Honor recipient and the museum has several of his personal items including his Medal of Honor on display. A display of artworks shows the talents of famous painter of Alaska, Fred Machetanz. The museum also features an early Hardin County History display that features items belonging to frontiersman Simon Kenton as well as many Native American artifacts.